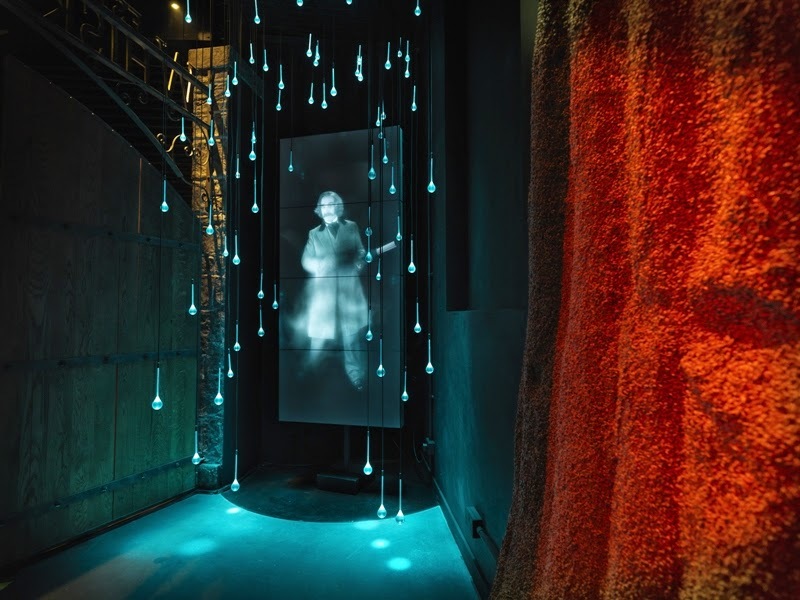 Fluid London's editor Christian Rose-Day takes a trip up to the Scottish capital and discovers some hidden gems. In a word: nothing. We can all find hundreds of ways to explore and experience London on the weekend, especially with so many bars and restaurants. But sometimes it's nice to get away for the weekend, to take a city break, to see how other places do what we do all the time. 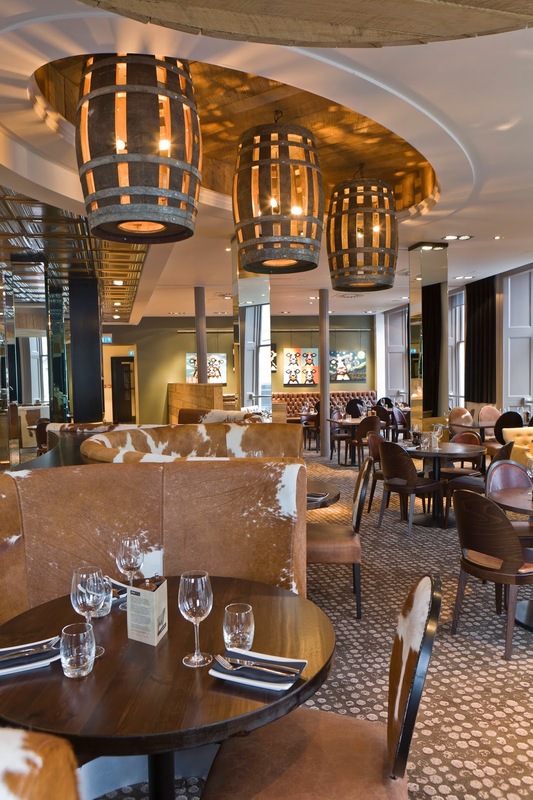 And besides, Fluid London's sister website, Fluid Edinburgh, needed some hotel restaurants visiting, so what a perfect excuse to visit the Scottish capital. Edinburgh Castle is awesome almost from any angle. This view from the west looked particularly impressive with the clear blue sky as the backdrop. 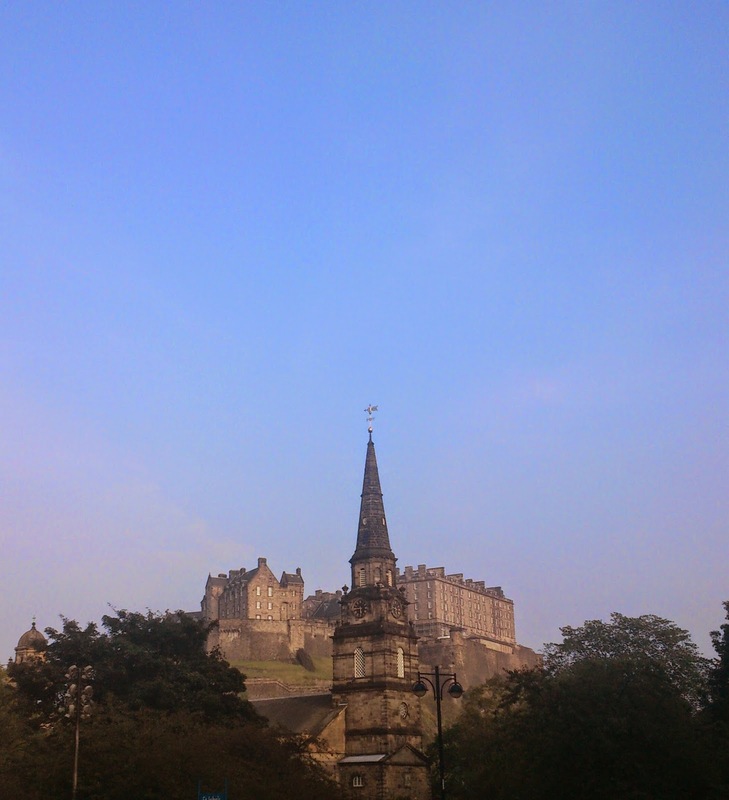 Edinburgh Castle bisected by the Church of St Cuthbert also makes for a dramatic backdrop. And this is where our weekend city break in Edinburgh began, just outside the boutique Rutland Hotel, where we stayed for our first night. 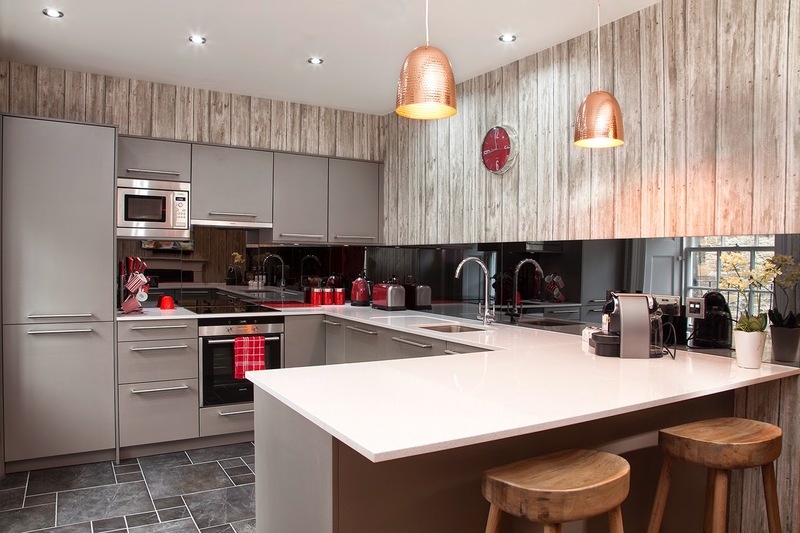 We were booked in at one of the Rutland Hotel's brand new luxury apartments, just a few doors down from the main hotel and Princes Street Gardens. 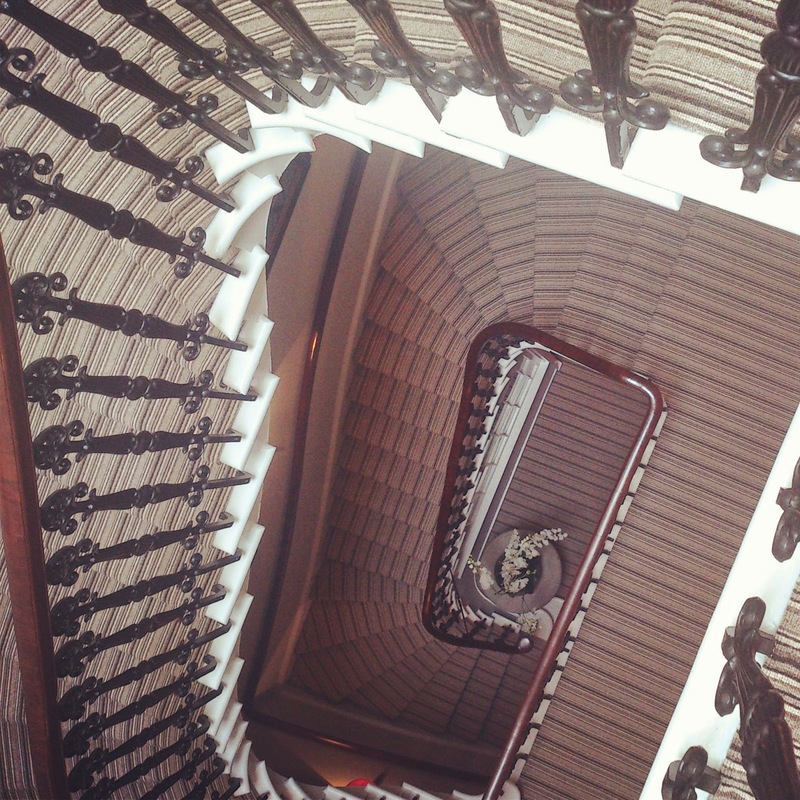 These apartments sit on several levels of a beautiful building that has retained its glorious staircase. 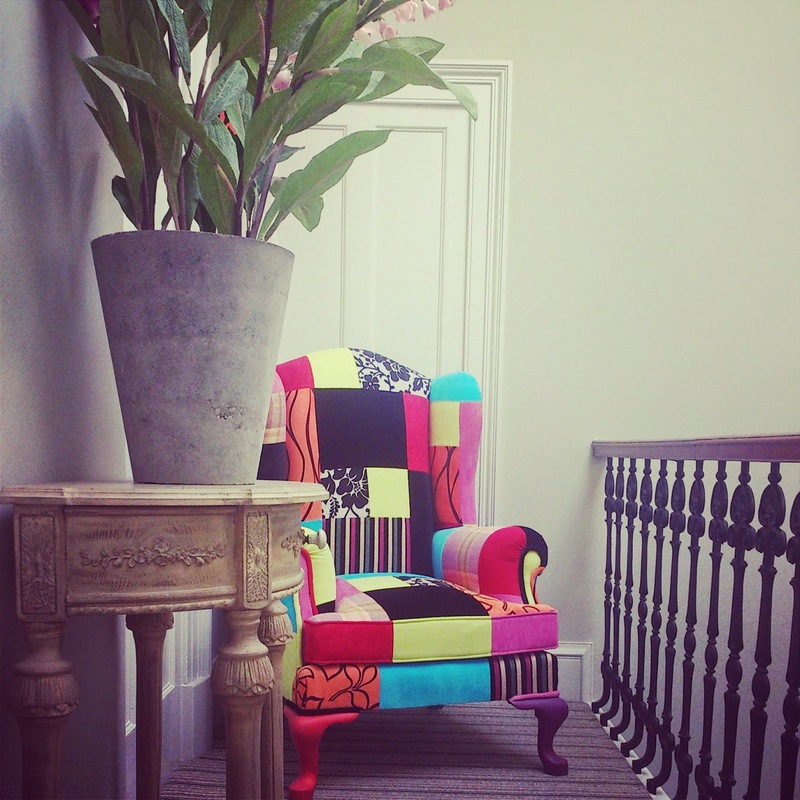 On the top floor, just outside the apartment, a colourful retreat for quiet readers, perhaps. 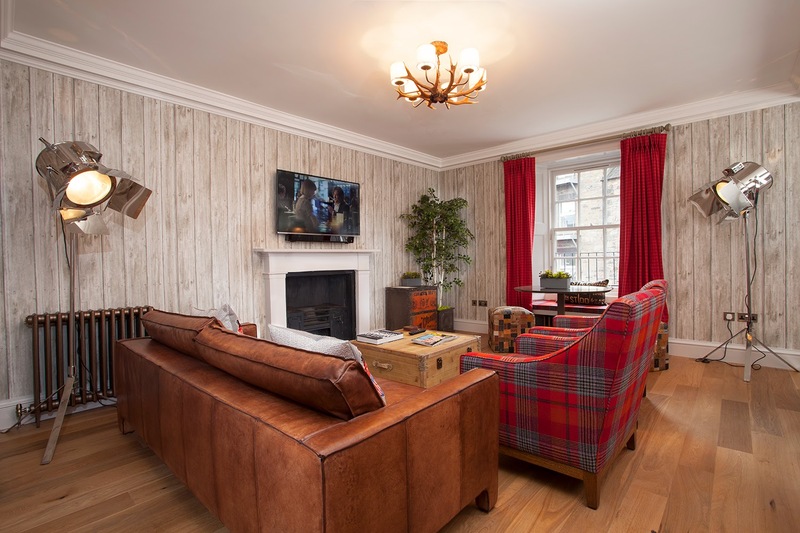 The apartment we stayed in was modern and masculine, with hints of Scottish flavour dashed about the place. Note the tartan seating and antler light fittings. A lovely little coffee/reading table and window seat in the lounge area. Comfy seating directly facing the wall-mounted TV. A full loaded kitchen with all necessary appliances, in case we found nothing to do in Edinburgh (unlikely, but still nice to know it was there). The brighter of the two bedrooms in our apartment suite at The Rutland Hotel. The second bedroom came with a leather covered make-up desk and mirror as well. And those rugs were super cosy. The bathroom was fitted with a jacuzzi in the bath and mirror that was unaffected by steam. Mod cons! Love the fancy lavender scented bathroom products. 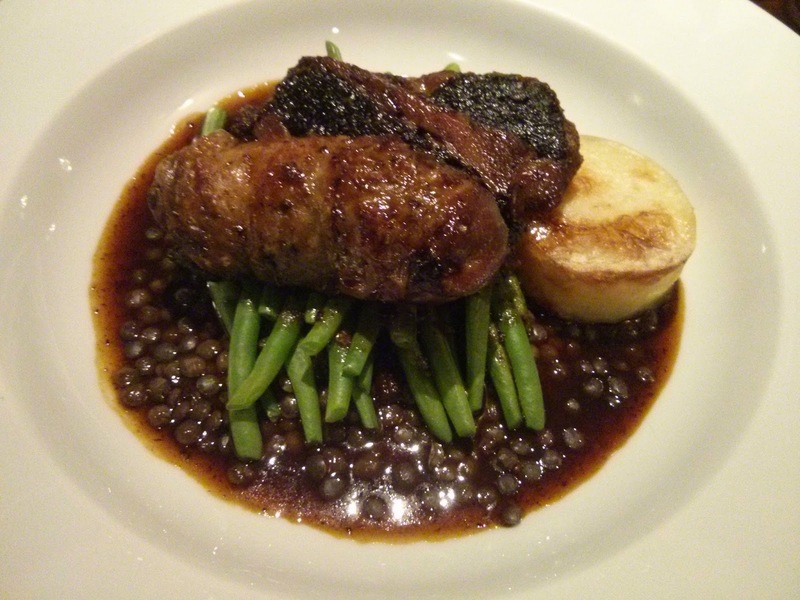 The Rutland Hotel's restaurant is called Kyloe (read my full review). The menu is heavily based on steak. 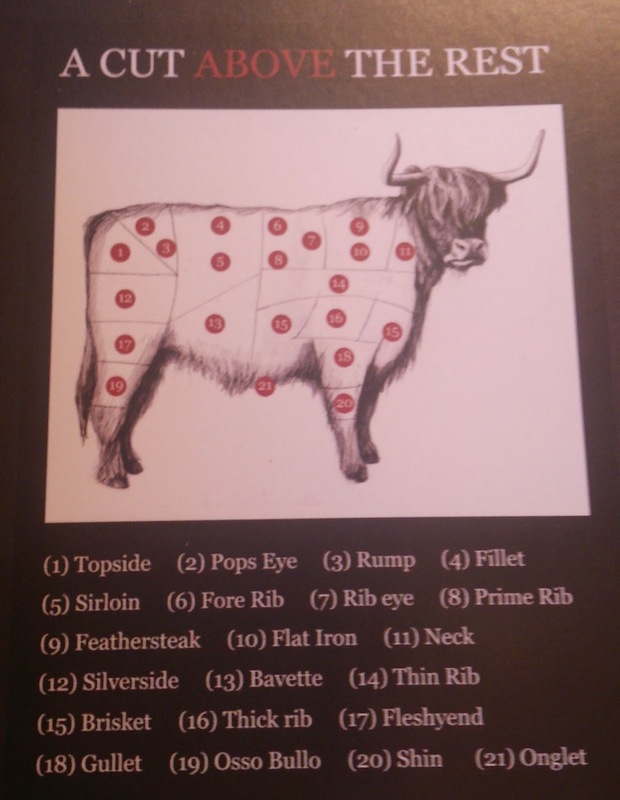 In case you're not sure which steak you'd like to try, this handy guide should help you make a decision. 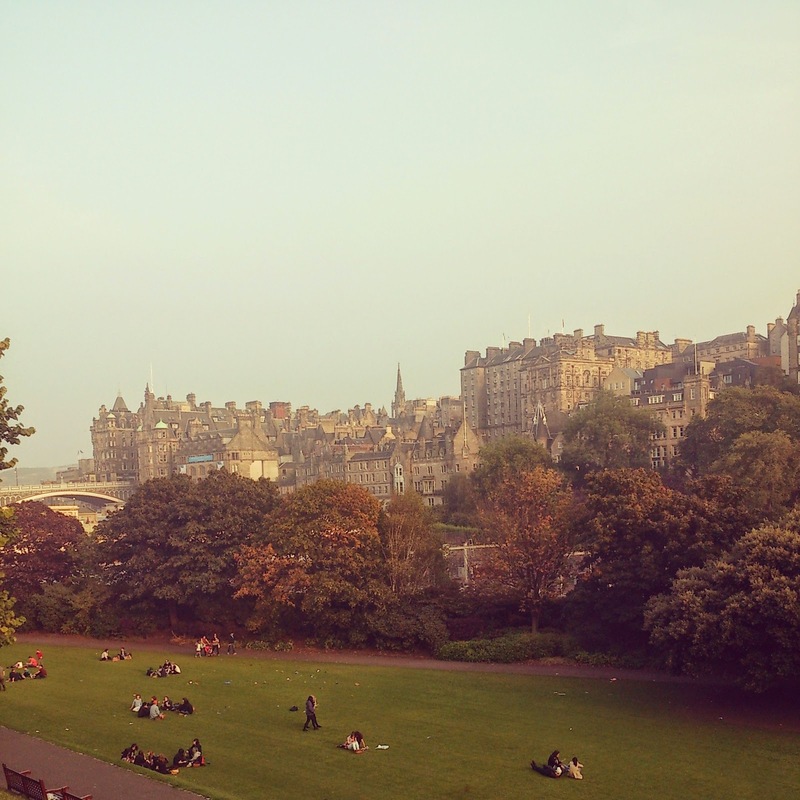 Princes Street Gardens is a beautiful place to start your aimless meanderings around Edinburgh city centre. 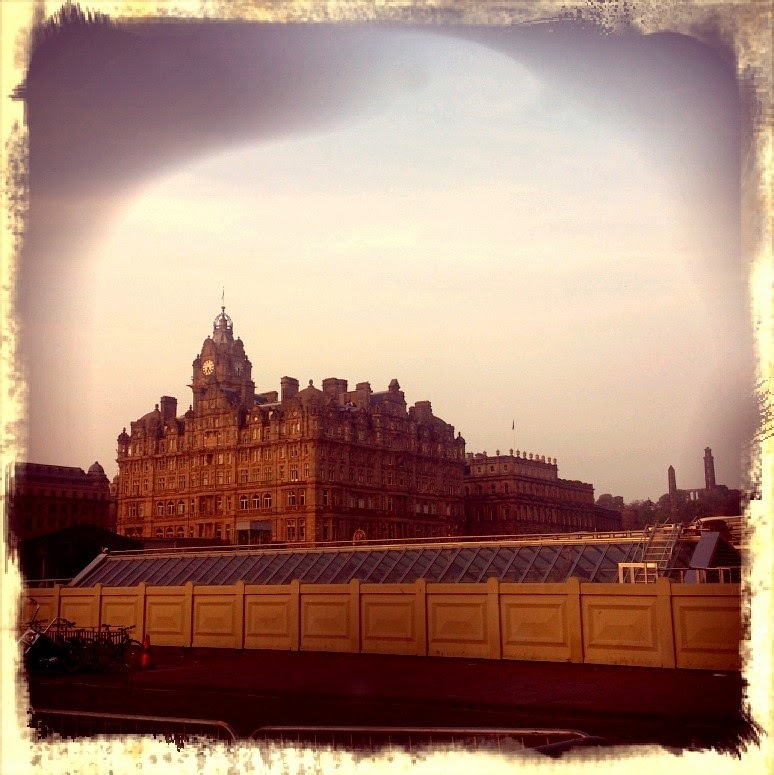 The Balmoral Hotel next to Waverley train station in Central Edinburgh also looks like a grand place to stay. 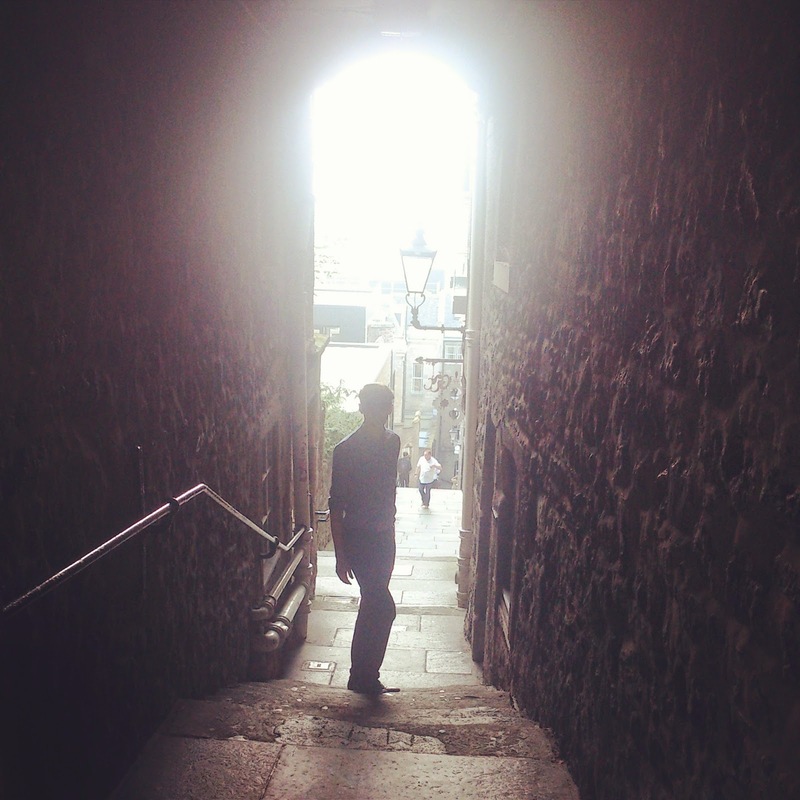 Go on, take one of the hidden corridors that pop up along the Royal Mile in Central Edinburgh. You never know where it may lead you. 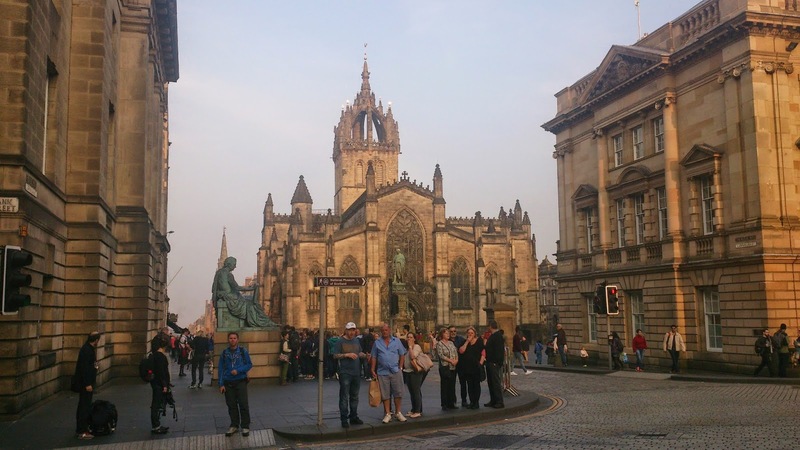 St Giles Cathedral on the Royal Mile in Edinburgh is well worth a visit. Beautiful stained glass windows, and marvellous decorative features. The church organ is amazing. 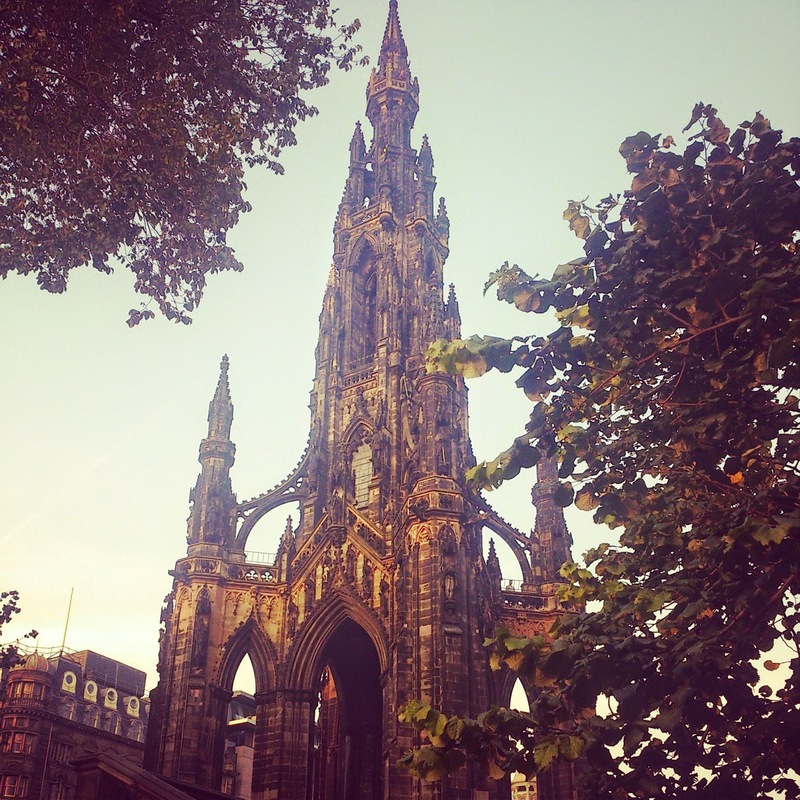 Scott's Monument in Princes Street Gardens; ascend only if you have a head for heights. 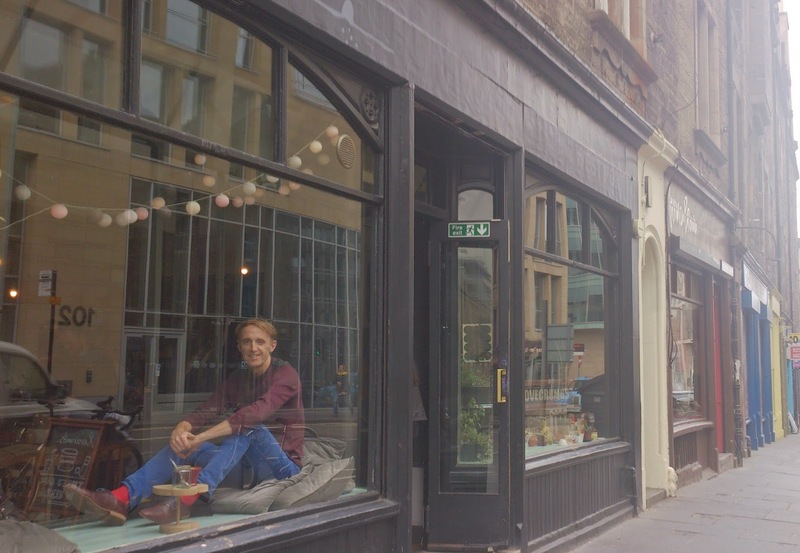 Here I am sat in the window of Lovecrumbs cafe near the bottom of Grassmarket in Edinburgh's Old Town. And yes, you can sit in the window and drink your coffee. Under no circumstances are you allowed to leave the cafe without sampling one, if not more, of their outstanding cakes. 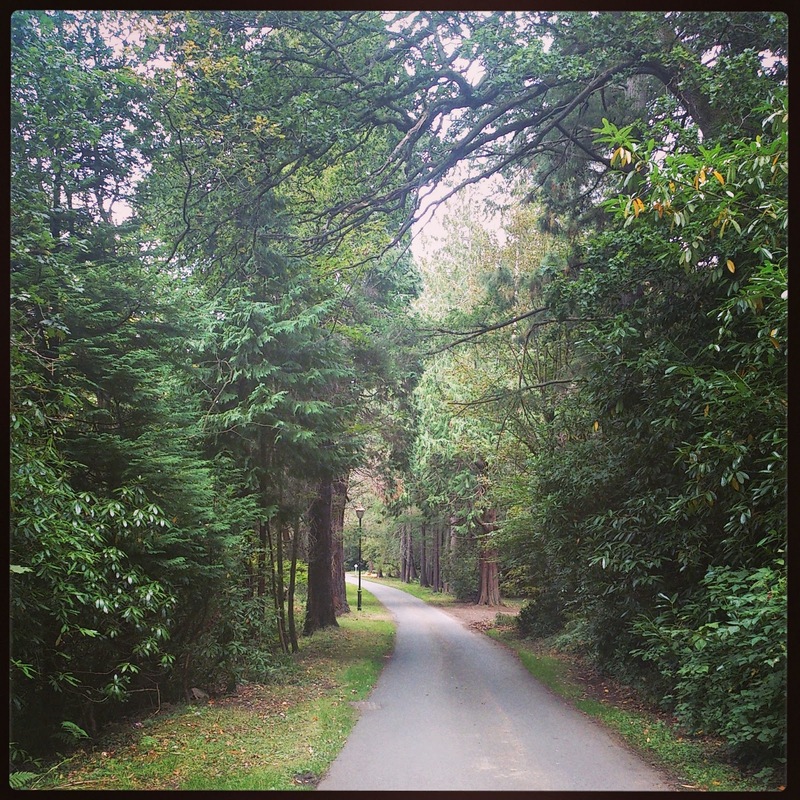 This is the driveway to Melville Castle, an 18th century mansion that was turned into a hotel in the 1990s. 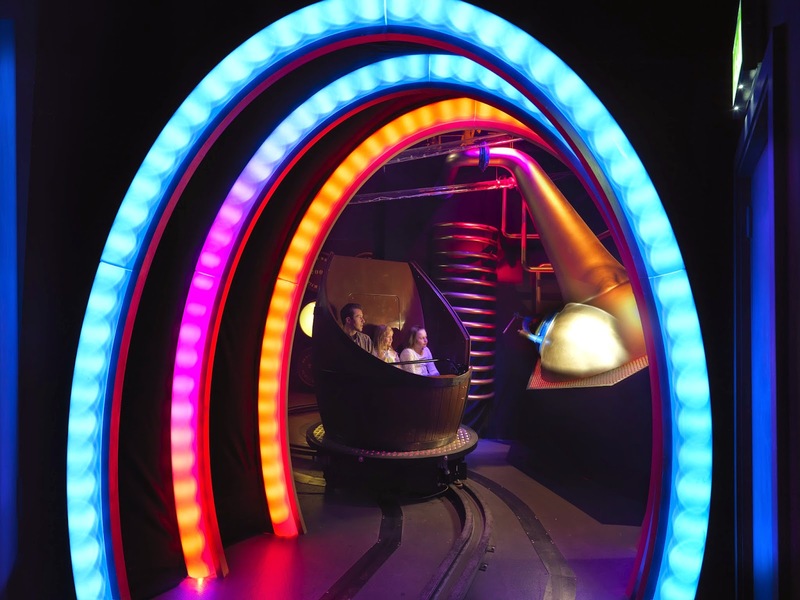 As the venue is on the outskirts of Edinburgh, you may have to have a car to get here. Alternatively, do as we did and catch a bus from Central Edinburgh to the top of the driveway, but only during daylight. Then you can enjoy the mile-long stroll to the castle through lush green woods. 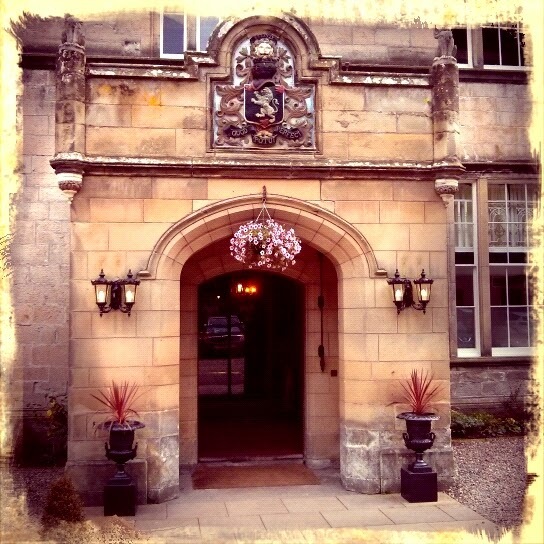 The impressive entrance to the castle leads into a classic Scottish lobby area, replete with dead animal heads and weaponry on the wall. Although the setting is amazing, the bedrooms themselves are severely dated. As mentioned, this place became a hotel in the 90s and it looks like it hasn't been refurbished at all since then. Still, the sleep was quiet and dark. Inspecting the view out of the bedroom window. Make sure you tale a walk around the grounds if you come here for a visit. It is quite something. And before dinner, stop off for a gin and tonic in the bar. 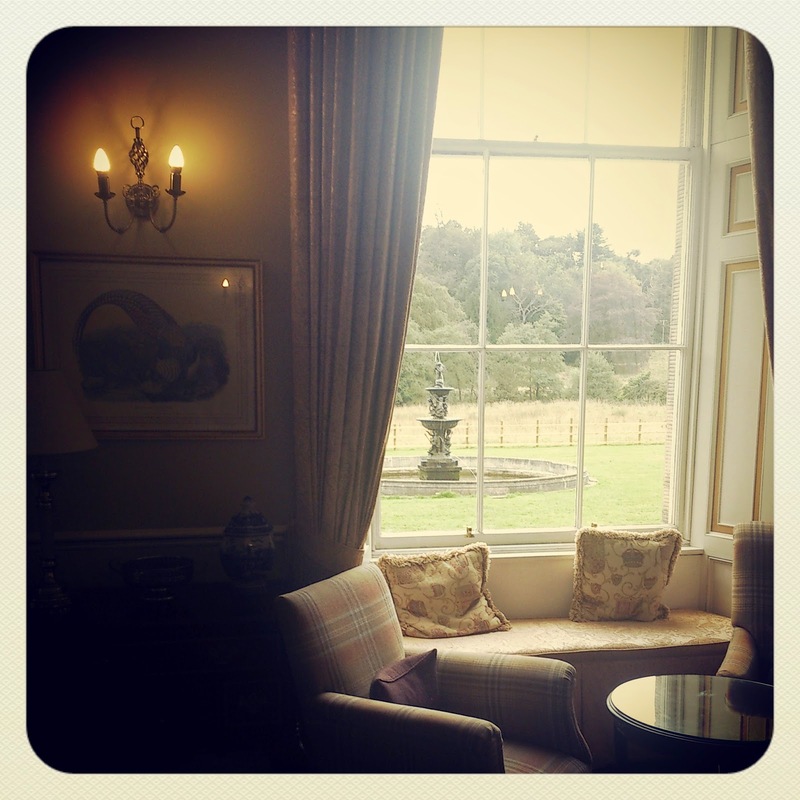 Just make sure you arrive early enough to snaffle the window seats overlooking the fountain in the garden. 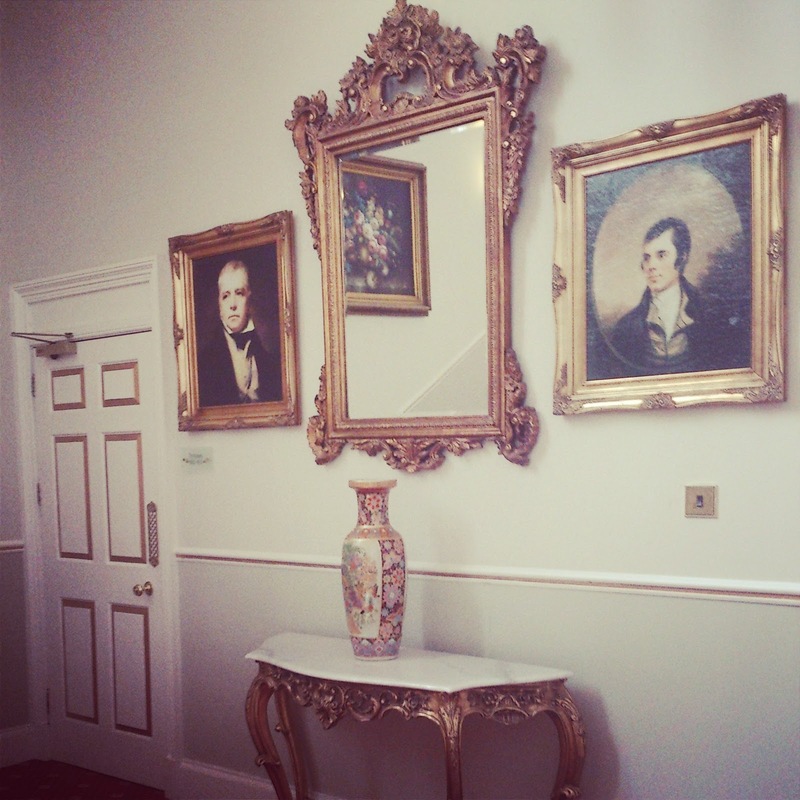 A familiar face on the stairs: Rabbie Burns, the famous Scottish poet. The restaurant, The Brasserie at Melville Castle, is, for unknown reason, hidden down in the dark basement. The experience down there is not a cosy one, as you can read from my full review. Too many hard surfaces, old furnishings, and bad music for my liking. That said, the mains are delicious and hearty, such as this ballotine of guinea fowl with Puy lentils, black pudding and apple, fondant potato, and fine green beans. This goes perfectly with a bottle of Picpoul de Pinet. 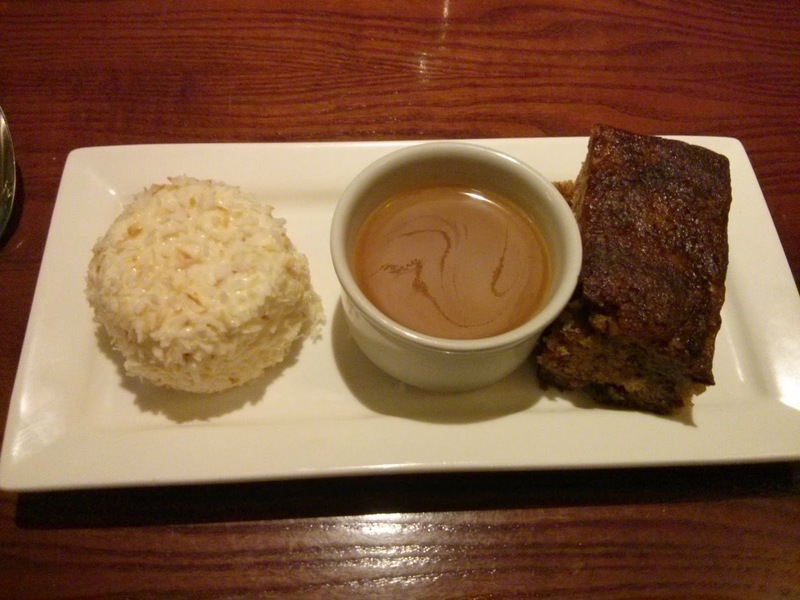 Dessert was also worth the lengthy wait: sticky date and banana loaf, Baileys butterscotch sauce, and iced coconut parfait. 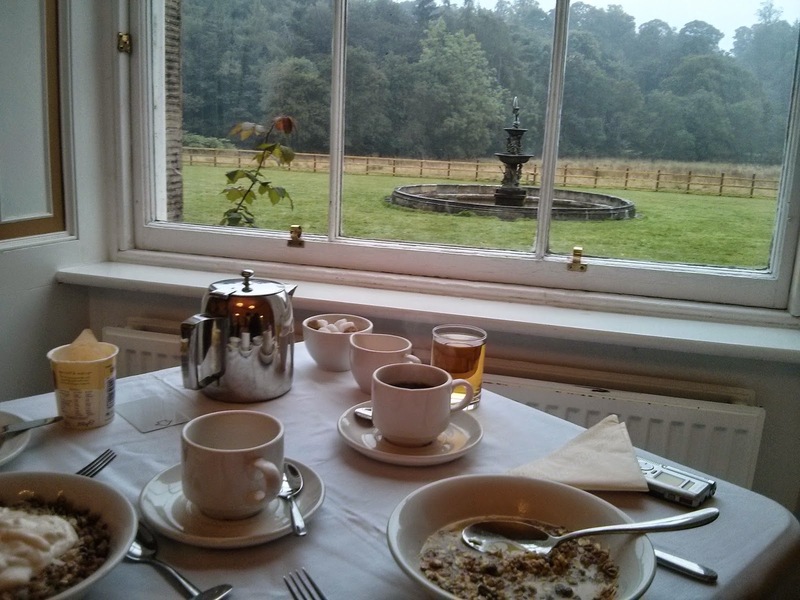 Breakfast in the ballroom next morning; again, make sure you nab a window seat. Really, the restaurant should move up here. 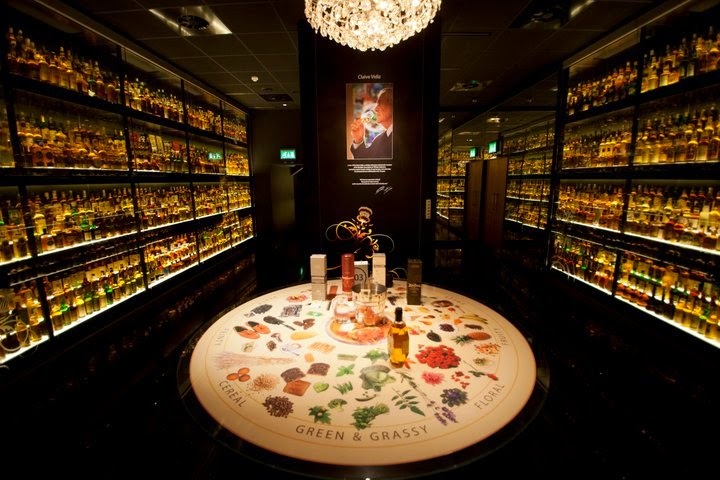 Before leaving Edinburgh we spent the last few hours learning about Scotland's great love affair with a certain refreshment at The Scotch Whisky Experience, right next to Edinburgh Castle. 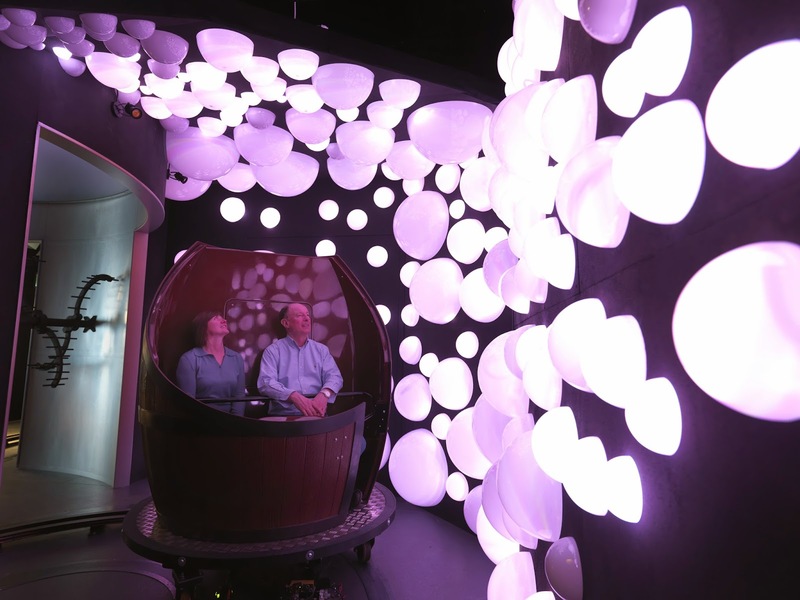 The barrel ride through the history and mechanics of whisky production made for an eventful introduction into the world of Scotch. And the collection of whiskies they have on site! My word! 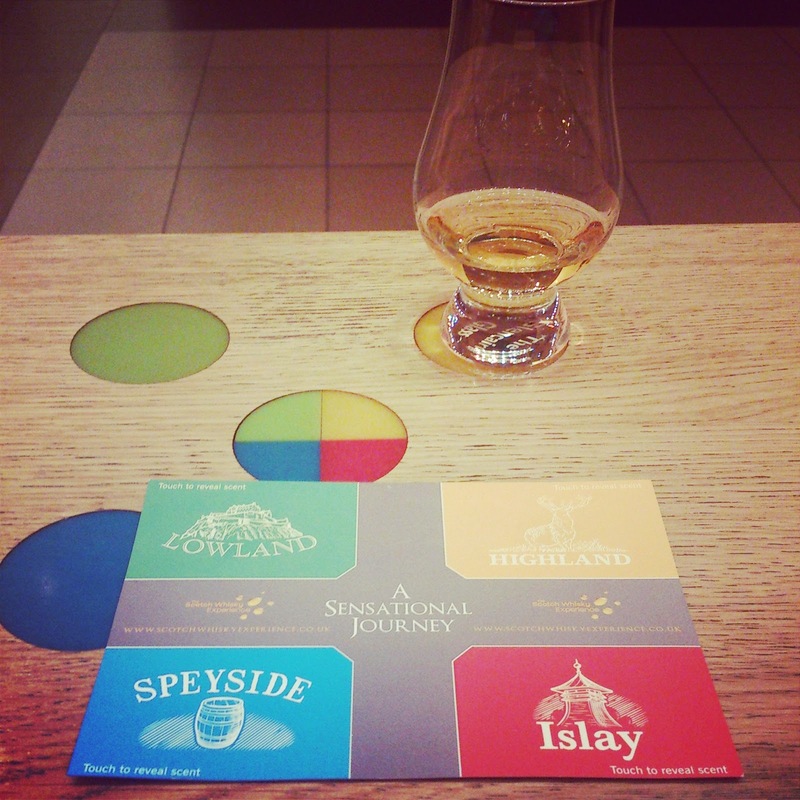 At one point on the tour there's a brief lecture about where whisky is produced in Scotland - mainly Lowlands, Highlands, Islay and Speyside - and to help everyone understand the different flavours that each of these types of single malt whisky possess, a handy scratch and sniff card is handed out just before the tasting, giving all the opportunity to offer their interpretations of smell. 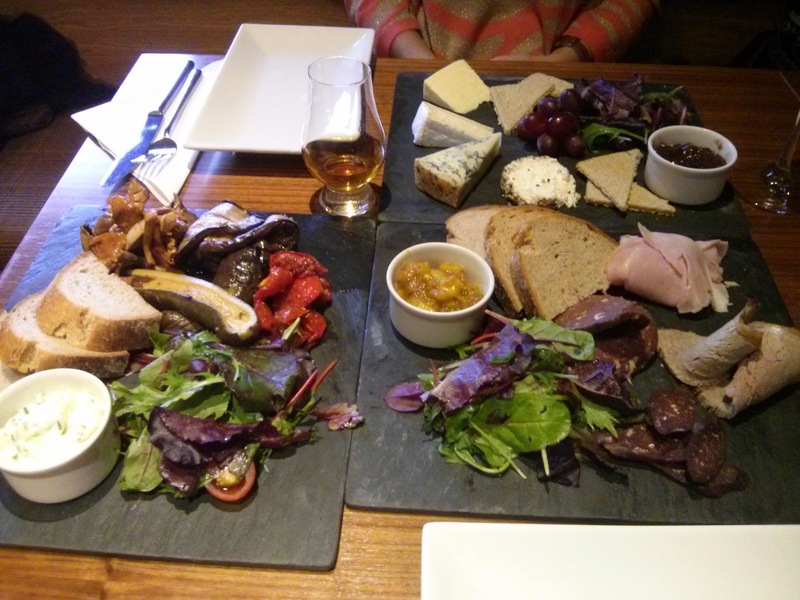 Before boarding the 4-hour train back to London, we stopped off at Amber restaurant and whisky bar at The Scotch Whisky Experience and stuffed ourselves silly with gorgeous Scottish meats, cheeses, breads and vegetables. 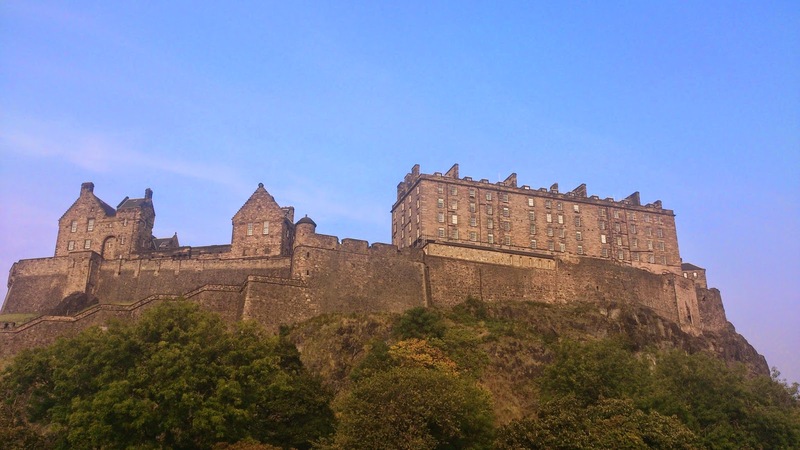 If you're planning a trip up to Edinburgh, check out the Top 10 guides on Fluid Edinburgh for inspiration. I can grow professionally, but compare hotel prices. I really like rate compare.com; it works like a Meta search for hotels. You just need to enter your desired location or hotel; select dates and filter for your preference and you get a bunch of results from various booking sites. It's very intuitive to use and page loading times are really fast in my opinion, I use the page frequently to check for hotels. …. Always when I see buildings like that, I always think about Dark Souls or The Witcher. If you never played these games, you should at least try out some videos on youtube, or if you are “busy man” check out images in the web. You will see resemblances right away. Also, your room was huge! 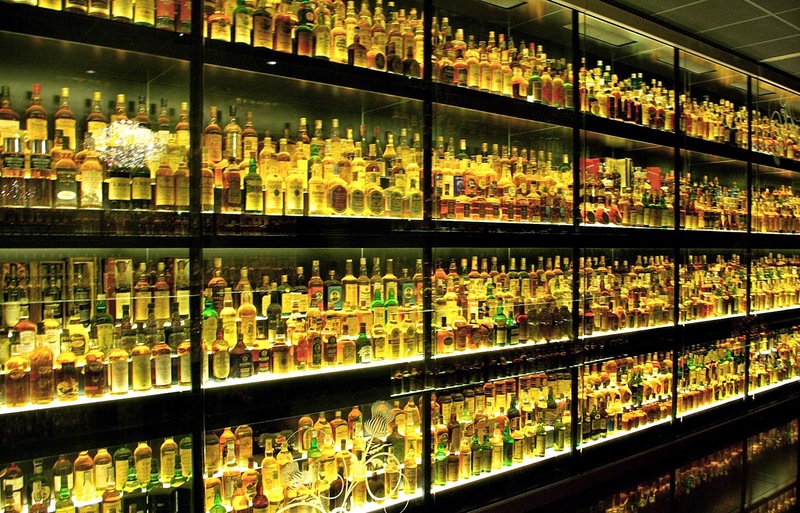 I don’t really have words to describe how much I’m impressed by the whisky collection you showed here. It’s looked like my favorite database of reviews on 123Writings and other paper writing services.